‘Dukesfield Documents’ is the result of a great deal of work over five years in two phases of the project by a dedicated band of volunteer enthusiasts and supporters, for some of whom this has been their first experience of working with original historical documents: Michael Bell, Alan Blackburn, Jennifer Britton, Gordon Carlton, Steve Casson, Colin & Hilary Clark, Chris & Susanne Ellingham, Greg Finch, Ian Forbes, Howard Forrest, John Gordon, Martin Green, Ian Hancock, Marjolijn Harrison, Jane Hughes, Gareth Jones, Hilary Kristensen, Pete Lee, Stafford Linsley, Susan and David Lynn, Christine Moorcroft, Diana Mulholland, Michael Murphy, Jennifer Norderhaug, Linda Pinkham, Mike Powell, Yvonne Purdy, Elizabeth & James Smith, Ian & Kathleen Smith, Liz Sobell, Chris Walker, John Waters, Gill Whatmough, Ron Whittaker, Jan Widmer, Elizabeth Williams, Catherine Wilson and Pat Wilson. Volunteers also helped with providing biographies of the main correspondents and other material available through these pages to support ‘Dukesfield Documents’. As part of Dukesfield Smelter and Carriers project, the costs of obtaining document copies, travel, training, meeting room hire and website development have been covered thanks to a Heritage Lottery Fund grant, with support from other sponsors. The Henry Bell Trust provided a specific grant to enable us to obtain copies of the second Michael Blackett letter book in Cambridge University Library. Since 2015 a further grant from the Hexham Local History Society has enabled us to continue transcription work. We are grateful to the staff of several record offices for their support during the course of the project in finding material, assisting with providing copies and training: Northumberland Archives, Tyne and Wear Archives and Museums, Durham University Library, Cambridge University Library, the North East of England Institute of Mining and Mechanical Engineers, the Society of Antiquaries of Newcastle-upon-Tyne, the Literary and Philosophical Society of Newcastle-upon-Tyne, University of Leeds Library, and also to the Allendale Estate for making available their own newly found material and enabling us to photograph any of their documents in the care of Northumberland Archives without charge. 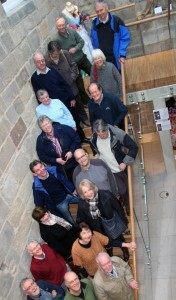 We have met in several venues in the course of the project and the years since, and our thanks go out to the staff and volunteers at the various locations, including Blaydon Library, Bywell Hall, Hexham Abbey, Hexham Community Centre, Core Music in Hexham, the High Forest Community Centre/Sinderhope, the owners of ‘Leadhills’ at Apperley Bankfoot, Stocksfield Institute Community Association, Hunstanworth Parish Hall, Acomb Parish Hall, the Newcastle Literary and Philosophical Society, the Newcastle Quayside Inn, Newbrough Town Hall, Ireshopeburn Institute in Weardale, Sparty Lea Methodist Chapel in the East Allen Valley, and Whitley Chapel Parish Hall in Hexhamshire. And Peter Davies of Digital Acorn in Hexham has done some great work to produce this website and database. The website is now under the management of Hexhamshire Parish Council, aided by sales of the project publication Images of Industry written by Ian Forbes.